I work in the Groundwater Hydrology and Contaminated Land team for the Hertfordshire and North London area. We have a large population of more than 6.5 million people in a space of 3,200 km2, which can put pressure on local water resources and water quality. A growing population and changing climate is likely to exacerbate these pressures in the future. In Hertfordshire and North London, we rely on groundwater abstraction from the chalk aquifers for drinking water, which also feeds our rivers. More than 70% of the area’s groundwater resources are impacted by human activities, so the quality of its water resources is often affected. In order to help us to build resilience to a changing climate we are also looking at new ways to address growing pressures on our water environment. Our project clearly identified catchments that have significant water scarcity issues. We often look at water quantity and water quality issues separately and on a case-by-case basis. Water Footprint Assessment is a recent concept aimed at improving the sustainable management of water resources, as well as improving our understanding of how people use water, the amount of water that is required to support ecology and the volume that is needed to absorb pollution. Recently our team has been working with Water Footprint Network on carrying out a Water Footprint Assessment for our area. We not only looked at current water use but also projected it into 2060 and tested results against two climate change scenarios: wet and dry. The results of the study are launched at the World Water Week in Stockholm this week. We carried out a Water Footprint Assessment for the Hertfordshire and North London area which was split into 35 mini catchments. The water users are domestic (public water supply), agriculture and industry. The results were broken down further to groundwater and surface water. Our project clearly identified catchments that have significant water scarcity and/or significant water pollution levels and the relationship between the two. Water scarcity is predominantly caused by abstraction for public water supply in the upstream catchments. 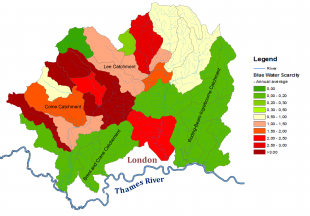 Higher pollution levels are caused by discharges of domestically polluted water via large discharge facilities downstream in the catchments and River Thames. Using Water Footprint Assessment to identify water resources issues that cause water scarcity in a clear and easy way, we can work with our partners to address the problems and plan for the future. The project also explored ways to apply Water Footprint Assessment within the existing regulatory context. We think it provides a necessary link between water quality and water resources that will allow an improved management of the essential and limited resource. For example, it could support joint water abstraction and water quality discharge consents. The results of this study can also be used to illustrate the issues of water scarcity and water pollution levels to water providers, water users and the public. The Water Footprint Network is an international, non-profit foundation that promotes and inspires strategic action towards sustainable, efficient and equitable water use worldwide. Giuseppe Frapporti is the groundwater, hydrology and contaminated land team leader in Hertfordshire and North London.